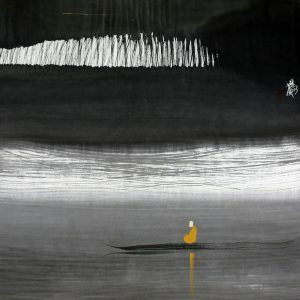 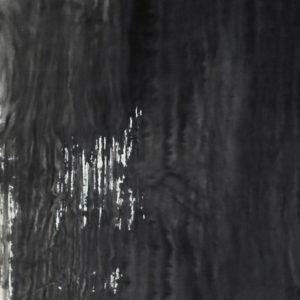 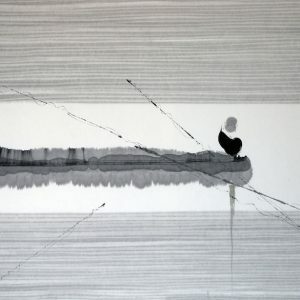 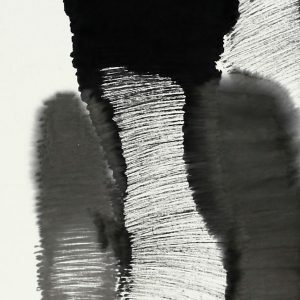 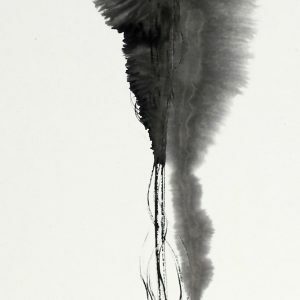 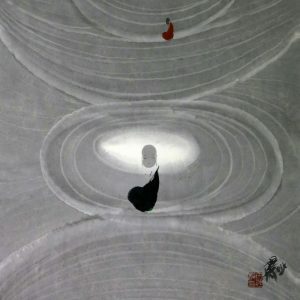 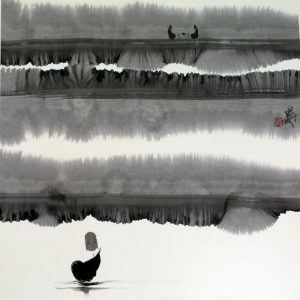 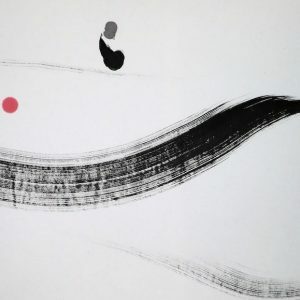 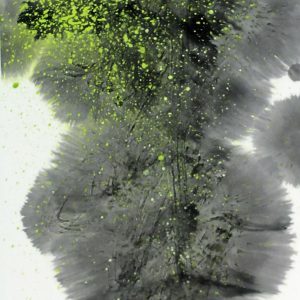 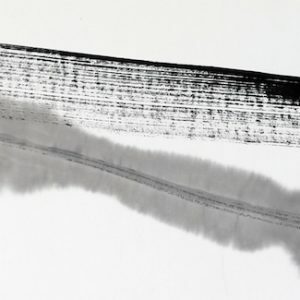 A perspicacious Chinese ink painter whose life and art are one and the same with the philosophy he depicts, Tian Xu Tong’s name has become synonymous with Zen for his distinctive black-and-white ink-paintings of sagacious monks meditating on boats on water or on mountain tops insinuated by nuances of lines painted in plain, abstracted space. 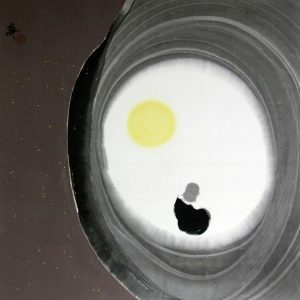 Pure, natural, elementary and calm, Tian’s composed seriocomic allegories take the imagination through boundless space with a leisurely and carefree lightness. 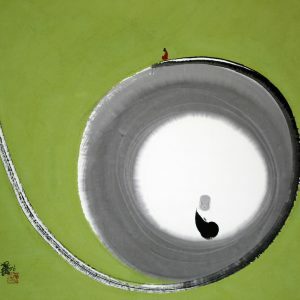 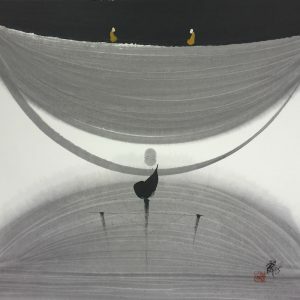 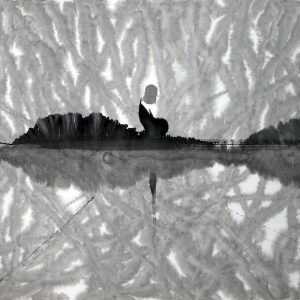 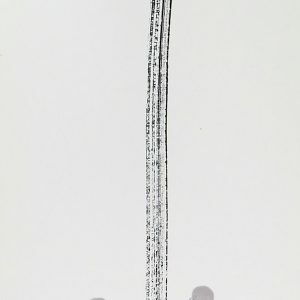 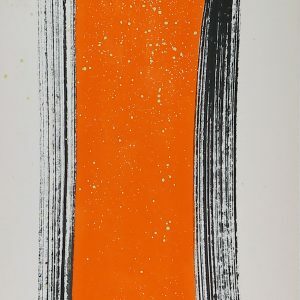 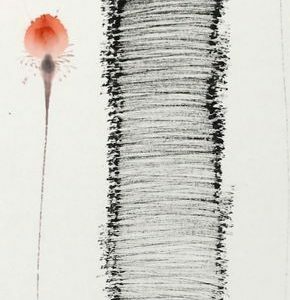 Incorporating and expressing both the clarity and power of focus, and infusing his works with the clever delight and simplicity of Zen philosophy on rice paper through ingenious brushwork and dexterity of conceptualization, Tian’s deceptively simple works embrace paradox on several levels and dimensions. 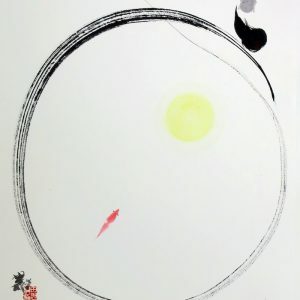 Often appearing straightforward and outwardly amusing, one finds great strength and intensity of mind and thought in his spatial projections upon deeper and often recurring reflection. 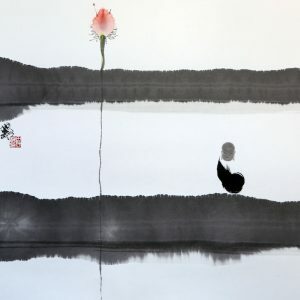 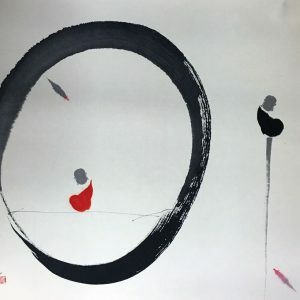 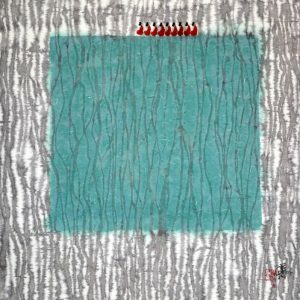 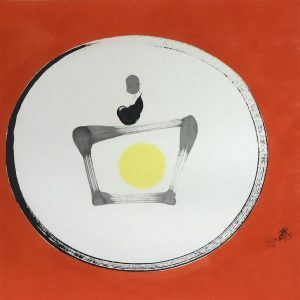 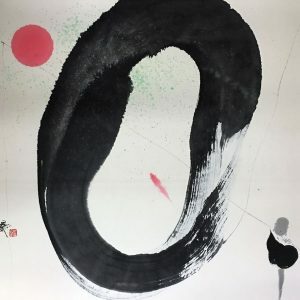 Since the late 1990s, Tian Xu Tong’s one-of-a-kind blend of abstract sage, serenity and drollness have brought a world of audiences not merely aesthetic satisfaction, but on a great level, peace and a sense of spiritual fulfillment. 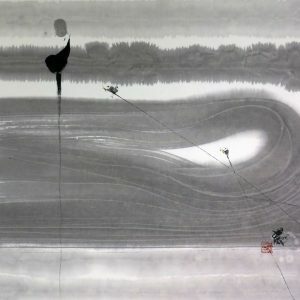 Born in Beijing in 1962, Tian Xu Tong graduated from the Central Academy of Fine Arts & Craft in 1985 with a major in ink painting. 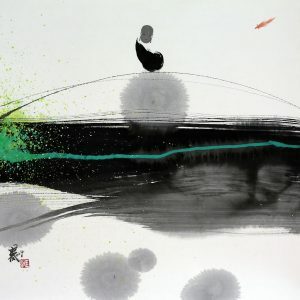 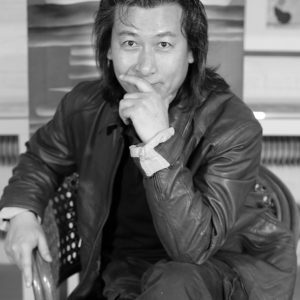 A congenial, spirited and highly creative artist by profession, he is also an art professor in Tsinghua University (Beijing), with 40 over publications – ranging from guides on sketching techniques and innovative design to Chinese decorative art and books on Tian’s ink painting collections – to his name. 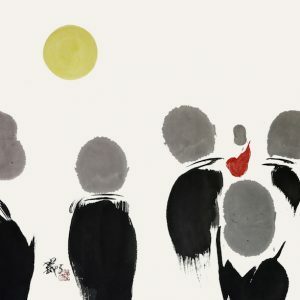 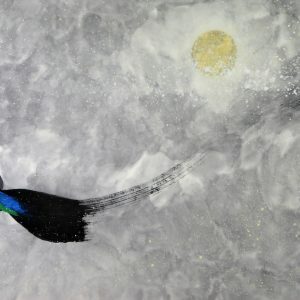 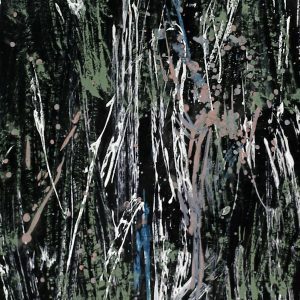 Starkness & Trueness – Modern Works of Tian Xu Tong, two solo exhibitions in China National Museum of Fine Arts and Singapore co-organised by HaKaren Art Gallery and Beijing’s Qinghua University, School of Arts.